See our list of foodcart franchise business options below for starters. Invest in one of the cheapest and lowest capital needed to put up a small business in the Philippines. Learn franchising and enjoy the liberty of financial freedom with less the time needed to manage all business process. They are outsourced to the franchise owner and you as the franchisee will just have to handle improving on your sales. How and Where to Invest for a Food Cart Franchise? So you don't know how to get a food cart franchise or apply for one? Here's basically what you have to do to get, apply or invest on a food cart franchise. To let you in and easily profit from an investment such as selling via a food cart, you have to know the pre-requisites. Why? because eventually, the original franchise owner will have to ask you these frequently asked questions anyway so might as well be prepared to have the answers. How Much Initial Capital or Investment Do You Have? What is your initial budget? Today, if you ask me how much initial capital you will need to put up a food cart business franchise, I'd say your going to need a start up money from Php 15,000 - Php 75,000. There are cheaper packages available though, you'll just have to find it by searching online. Of course you will not need anything else except for the stuff you will sell which you can buy from the franchise owner. With this initial capital, you can start up your own small business. It is a sure ball that you will be asked where you will place (pwesto) your food cart franchise by the owner. As a franchisee, you will have to prepare for this. First step is to go find a potential selling area. A mall or a market place, tiangge, or busy streets is most ideal. Have your market study ready as you are going to need it to defend your interest to purchase a franchise of any products selling or business. So what top questions should you ask from the original foodcart franshise owner? Well, think to your advantage this time. Here are a few tips you can ask. 1. What are the inclusives of the franchise offer? Does it include initial products for start up selling? 2. Does it include the manpower or crew to handle your kiosk store? 3. Does it include the tools and cooking utensils? 4. How about electricity? Rent for the place? 5. Transportation for the products? 6. Is there an available nearby center (commissary) for buying the food products you will sell in the foodcart? 7. Is there a royalty fee? Are the earnings of your food cart franchise 100% yours? 8. Is the franchising business offer a one-time pay, all-in, no hidden charges offer or is there anything else to cash out after buying a franchise right? 9. Who can avail of a franchise or how do I qualify to apply for one? OFW, housewives, retiree, pensioner, seaman, small business owners, employee, teacher, students, government employee, expat, balikbayan, entrepreneurs, food business investment seekers? 10. Is the crew training handled by the franchise owner or the franchisee? It is a must to know if the foodcart franchise owner offers a commissary or center for buying the specific products you sell. Remember that the name of the game in foodcart stalls and kiosks and in selling food via a cart, anywhere you may be is a steady stream source of products or supply. Without it, the foodcart franchise business will definitely die. Never purchase a franchise without the assurance that you can get supplies anytime during operation hours. If your supplies will come from far away places, the traveling time alone will kill the delicious taste of any food you sell. It will stink. Consistency of taste of the food you sell is very critical in this type of business. This is no secret ingredient. IT IS A MUST! period. Where to Buy, Avail, Apply or Get a Foodcart Franchise? So where do these food carts come from? Of course its from the owners themselves selling or putting up their business but where do you really buy, avail or get a foodcart franchise? If you don't have an idea, allow me to introduce you my jack of all traits father, Sam. He is the reason why this website is up in the first place. Yes, you guessed it right. He is also a food cart franchise consultant apart from being a certified earning loan consultant, SEO consultant, online marketer, affiliate marketing guru and the best father of all. So by this time you must've decided to go get your own food cart and you don't know where you can avail or apply for a franchise. 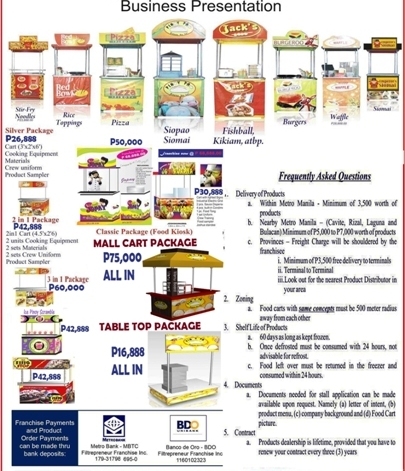 Please see our list of available food cart franchise in the Philippines. Otherwise, you can start by asking and trying to call my tatay Sam below.